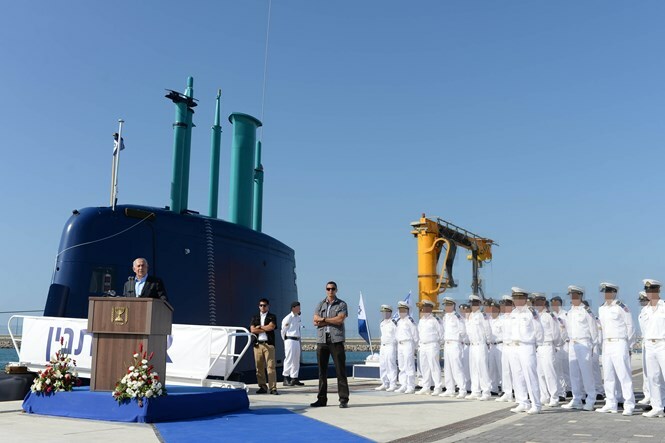 Netanyahu calls new INS Tanin 'a clear and pointed message to Israel's enemies'; navy flotilla welcomes most expensive IDF craft. 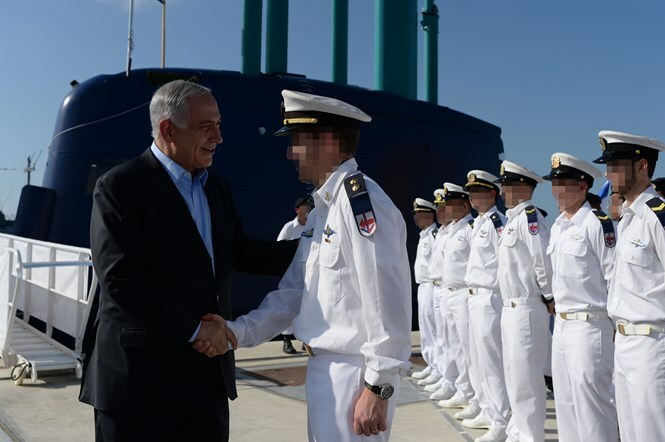 Prime Minister Binyamin Netanyahu led a delegation of senior officials welcoming the Israeli navy's fourth nuclear capable Dolphin-class INS Tanin submarine on Tuesday at the Haifa naval base. 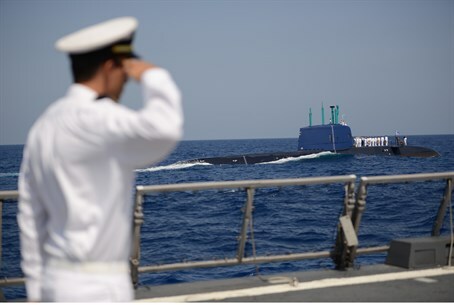 A flotilla of Israeli warships, missile ships, submarines and naval commando vessels set out to welcome the latest lethal addition to Israel's maritime arsenal. 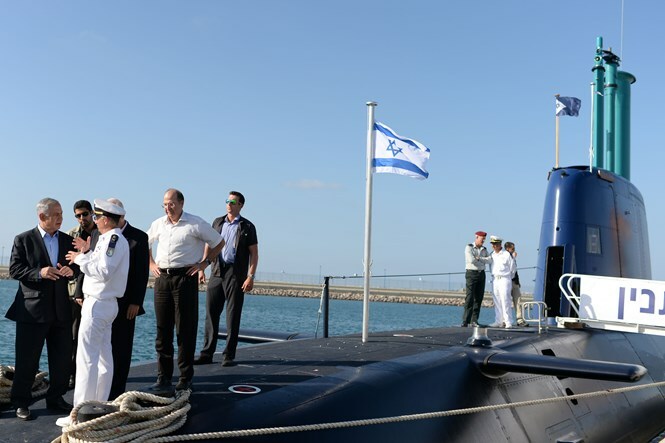 The new submarine, which arrived from Germany, was greeted by Netanyahu, President Reuven Rivlin, Defense Minister Moshe Ya'alon, IDF Chief of Staff Benny Gantz and Israeli Naval Commander Ram Rothberg. "This event gives a clear and pointed message to our enemies - the state of Israel stands firm against any threat, any challenge, in any location," stated Netanyahu at the ceremony. Rothberg praised the Tanin crew, saying "Tanin fighters - you are the longest arm of the IDF. Quiet, lethal and powerful." Reportedly Israel has modified the Dolphin-class submarine's 650mm launch tubes to allow the launch of missiles that could carry nuclear warheads. The craft, which is the single most expensive vehicle in the IDF's arsenal, features state-of-the-art Air-Independent Propulsion (AIP) systems, which allow it to operate without the need to access atmospheric oxygen by surfacing or using a snorkel. This makes it virtually silent and potentially stealthier than nuclear powered submarines. 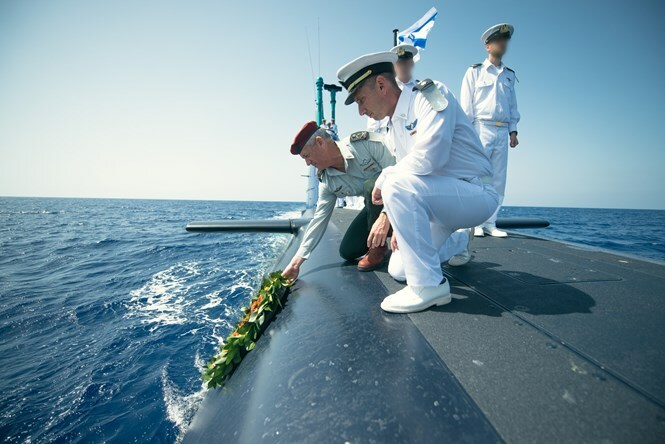 A day before the Tanin reached Israel, Gantz and Rothberg took part in a wreath-laying ceremony at sea on board the deck of the submarine, in memory of the fallen soldiers of INS Dakar, at the same location where the navy lost contact with the submarine 46 years ago. Speaking about the fallen vessel, Gantz said "over four decades have passed since the last departure of the INS Dakar, and the goal for which the submarine fighters and commanders left the Gibraltar port towards the coast of the state of Israel remains the same." The new INS Tanin is modeled on the German Navy's lighter and sleeker Type 212 submarine, and not on the export-only Type 209 as were the first three Israeli Tanin submarines. Each Dolphin-class submarine is capable of carrying a combined total of up to 16 torpedoes and Submarine-launched cruise missiles (SLCMs). The cruise missiles have a range of at least 1,500 km (930 mi) and are widely believed to be equipped with a 200-kilogram (440 lb) nuclear warhead containing up to 6 kilograms (13 lb) of plutonium. Israel has already purchased a a fifth Dolphin-class submarine at a subsidized rate from Berlin, and has an option for a sixth.